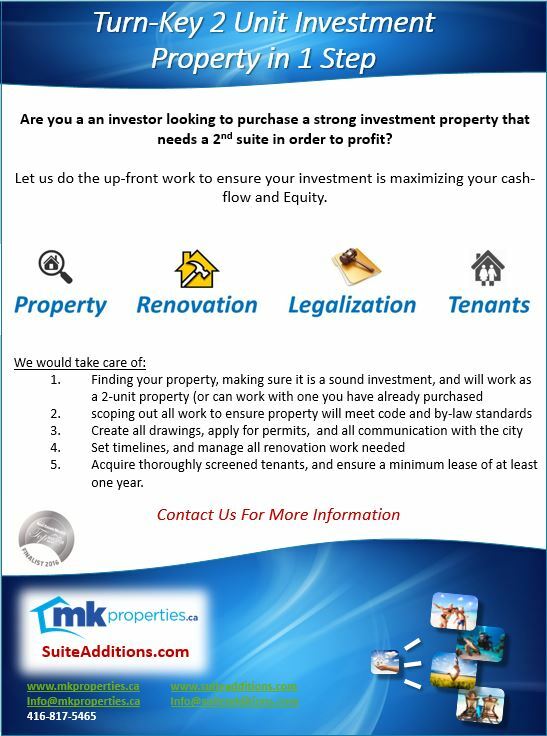 MK Properties / Uncategorized / Boost your Real Estate Returns with Legal Second Suites! We’ve had quite a bit of news over the last couple of weeks on the government doing something about our surging real estate market. Although we agree with some of the measures, the long term economic impacts of our immigration, the rapid expansion of transportation (GO train) across southern Ontario and the scarcity of land with Lake Ontario and the Green Belt are likely far too strong to stop the long-term demand on housing we should expect over at least the next decade. Our opinion is that these measures will have an impact only in the short term (likely not a recessionary price-index drop, but rather cooling off of growth rates). The government took a stance on rent control, which we think is a positive thing to allow for affordable housing, but they did very little in focusing on the larger problem…Supply! With controls in rent, there is little incentive to build rental units for developers, this is what started the condo craze decades ago, and because of it, there was almost no purpose built rental apartments for over 2 decades! With the surge in population growth for our foreseeable future, the lack of supply will mean there is likely going to be constant demand for places to live in Southern Ontario, this government control will help keep rents down for those staying in their homes for many years, but once tenants turn over, you can expect a spike in rents to what the market will dictate. I personally have had bidding wars on some of my rental units that become vacant, this shows that the housing market is not only about purchasing a home, but also about finding a nice home to rent as well. Taking this approach in real estate, our profit is essentially the cashflow we make from our tenants each month, as well as the value of the property when we choose to refinance or sell. Our costs are anything and everything to manage the property. Our investment model when we purchase a property typically involves changing the use to allow for more units. 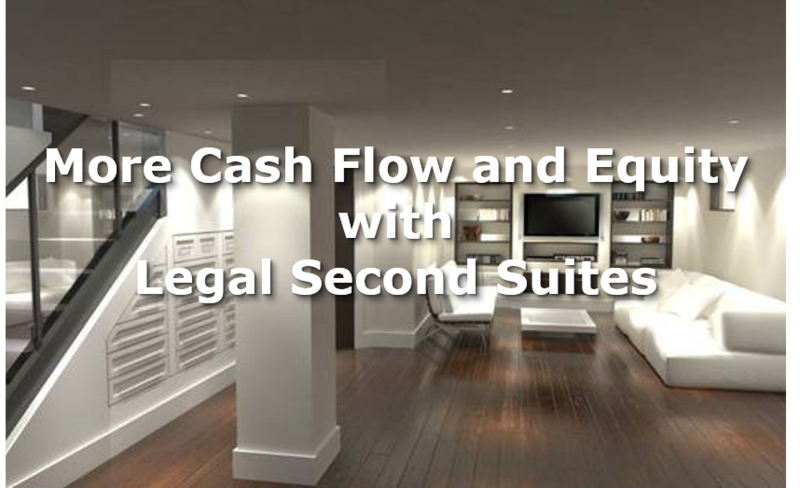 90% of the time when purchasing a single-family home, this involves putting in a legal second suite in the basement. We first identify homes that will meet the main by-law requirements for a specific municipality, this typically involves: Zoning, Parking, Ceiling height, square footage, and Egress (means for Exit). Once we purchase the property, we work with our team to produce design drawings and approach the municipality to make a legal second suit. This essentially does 3 main things for the return on investment. Better Cash Flow: Increases Monthly Income and Cash Flow. Higher Appraised Value: Increases overall value of property by forcing appreciation upward (typically more than the cost of renovations alone). Lower Risk: With having a property that has two income producing units, we are now spreading our costs among two units rather than one (ie roof), and if there is a vacancy, then there is still monthly income coming in from the other unit to help offset expenses. By the comparison above, we try to illustrate that there is a significant advantage to putting in a second suite. The cash flow alone mitigates market risk from inflation or interest rates as well as property repairs over time. 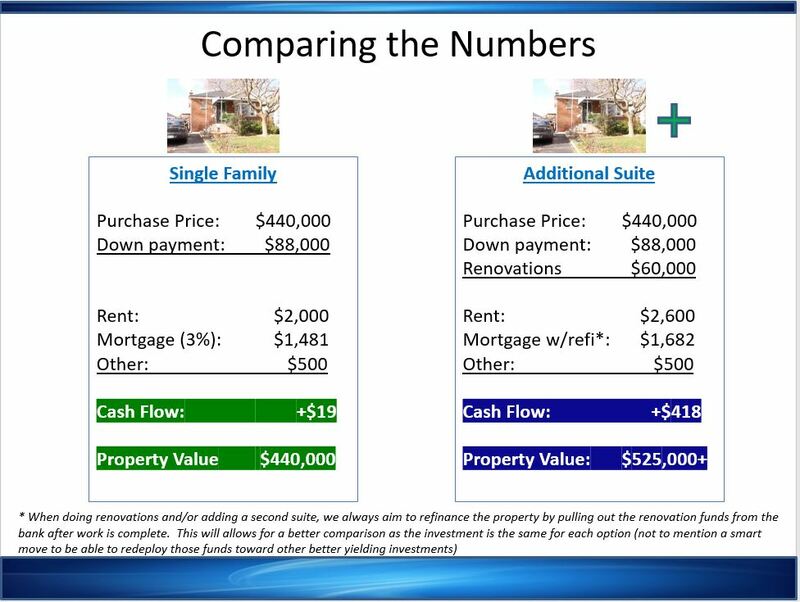 Through the conversions that we have been responsible for and know through our investor network, we have seen a single-family home property value increase +$20K to upwards of +$50K over-and-above the renovation and costs to convert (this is pure profit to the owner of the property). We also assume in the above example that after renovations are complete we would refinance the property to pull out the renovation funds. This then has the same investment amount on both scenarios. Although we never bank on getting that type of value improvement, the likelihood of it happening is quite good, and it provides the “cherry-on-top” of an already sound business decision. Many new (and experienced) investors are fearful of working with the city, or going through the work associated. However, as with any business, it makes sense to at least consider something that can have a positive affect on your business. There are also many services out there that can handle the renovations and all dealings with the city so you would need to have minimal involvement. Someone who has quickly become one of Canada’s leading authorities on Second suites is Andy Tran from www.suiteadditions.com. Andy is a former building inspector and instructor who now exclusively works with those who would like to expand the use of their property. He has written a book called 2nd Suites: A Beginner’s Guide which you can download for free from his website. It is a great read, and he also has quite a good blog on the subject as well. Andy has personally worked on many of my own and my clients’ conversions and has become a good friend as well. Many new investors that are looking to invest in an income property and increase their returns through the use of a second suite, are quite uneasy about all the steps and the work involved. MK Properties and Suite Additions have teamed up to provide the investor with a solution that would take all of the up-front work involved, and provide the investor with a fully tenanted turn-key property. If you live in the GTA, we have started the Vaughan Real Estate Investors Club – a meet up run by investors for investors. If you are just starting out, or a seasoned pro, come out to Learn and Network with others like you. Click the link above to go to our site on meetup.com or visit our page on facebook. 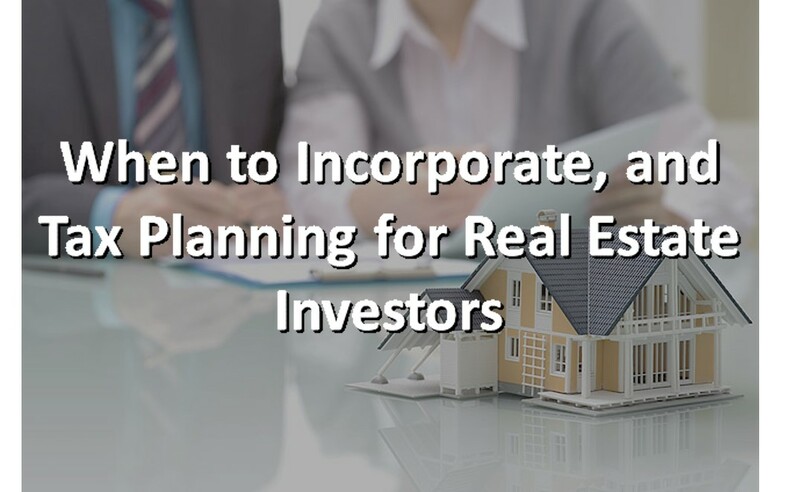 Our next meetup will take place on Wednesday May 24th where we will have guest CPA Cherry Chan discuss tax planning and corporations for your real estate investments. Please RSVP at www.meetup.com/VaughanREIC or our group on facebook to join us.